Around Christmas time, Q&A sites are flooded with questions such as “help, my cat ate a poinsettia; what should I do?” and, “my dog just ate some poinsettia leaves; will he die?” Pet owners are understandably scared, as many have seen the poinsettia on toxic plant lists. However, such lists can be misleading, as some plants on these lists will cause rapid death, whereas others will induce only mild irritation. Poinsettias fall into the latter category. 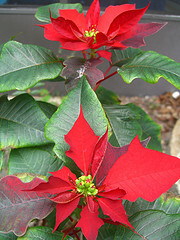 The milky sap of poinsettias can cause irritation of the mouth and digestive tract. A pet that has consumed portions of a poinsettia may experience excessive salivation and vomiting due to irritation of the gastrointestinal tract, but this should clear up on its own. If a cat or dog has ingested a large quantity of the poinsettia, placing a call to a veterinarian or local animal emergency clinic is recommended just to be on the safe side. However, this is unlikely, as poinsettias aren’t particularly tasty. Although poinsettias have an undeserved reputation as a dangerous plant, it’s lilies and sago palms that pet owners should avoid keeping in the house. Lilies are beautiful but deadly. Consumption of any part of the greenery or flowers can induce fatal kidney failure in cats. Just biting a petal or leaf, drinking water from a vase containing cut lilies, or licking lily pollen from his paws may kill a cat. Cats that don’t die outright from lily poisoning often require weeks of dialysis. Dogs aren’t as susceptible to lily poisoning as cats, but they can be sickened by these plants. However, they’re more often poisoned (fatally in 30% of cases) by sago palms, as the woody sago bark is attractive to them, though some cats have also been poisoned by sago palms. To be on the safe side, pet owners shouldn’t keep lilies or sago palms in their homes or their gardens (sago palms present a risk to small children as well). Grow some edible grass (typically wheat or oat) or catnip indoors – most pets will choose these over less appealing houseplants. Surround plants with something that pets dislike walking on, such as Sticky Paws® tape or carpet runner (pointy side up). Use a product that makes the leaves less appealing, such as Grannick’s Bitter Apple® or Veterinarian’s Best® Bitter Cherry Spray. Purchase a motion-activated device that emits a harmless burst of air to startle pets as they approach plants, such as the SSSCAT® cat repellent device. Spraying plants with vinegar is often recommended as a deterrent, but this may harm the plants. Other recommended strategies, such as moth balls, citrus oil, or chili powder, can harm pets, and possibly children as well. For a list of non-toxic plants and flowers, see the Plants page. Choosing organically grown plants is recommended, because pesticide residues can harm pets as well. In addition to the ubiquitous poinsettias, the holiday season is accompanied by a broad array of food and drink, but some of these human treats can be harmful to pets. See Foods That Are Toxic to Cats and Dogs for a list of items to keep out reach of inquisitive paws. ASPCA Virtual Pet Behaviorist. (2009). “Cats Who Eat Plants.” ASPCABehavior.org. David Suzuki Foundation. (2008). “Mothballs: They Smell Bad for a Reason.” DavidSuzuki.org. DeGioia, P., Veterinary Information Network. (7 April 2010). “Sago Palm Poisoning Cases Increase.” NewsVIN.com. Drs. Foster & Smith, Veterinary and Aquatic Services Department. (2011). “Citrus Oil Toxicity in Dogs and Cats.” PetEducation.com. Lane, M.C., Dr. (n.d.). “My Cat Ate a Poinsettia, Now What?” I Love Cats, ILuvCats.com. UC Davis, University of California. (3 April 2009). “Lilies Deadly to Cats, Veterinarians Warn.” News.UCDavids.edu.